A pre-rock group who sang and played their own instruments and were primarily a club act for a dozen years or more but who had limited success on record and only a brief flirtation with rock ‘n’ roll before disappearing. The Four Blues were mostly out of Philadelphia and formed at the tail end of 1939 or early 1940. 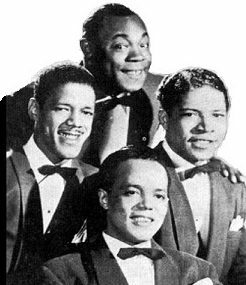 They began as a club act in New York, though one apparently with some appeal as they soon secured a recording contract with Decca, one of three major labels at the time giving some indication as to their potential. Though their Decca material was not commercially successful, and in fact their two records cut at that session were released more than a year apart and maybe only then due to the first recording strike which necessitated the cleaning out of the vaults just to have enough releases, they were able to use that exposure to travel to California for some gigs but after that settled back into the local Philadelphia club circuit with little hope for breaking out of it. Decca gave them a second chance in the mid-1940’s with another session but apparently weren’t impressed as this time nothing was released. Their next shot came with a label more suited to them, as DeLuxe signed them and had them do an extended session but oddly enough released the weakest material first, holding back until their fifth release their one moment of inspiration on “The Blues Can Jump”, a song that was definitely looking forward stylistically. But just one more gospel-styled record on the label followed. They show up again on record two and a half years later when they signed with Apollo and cut their closest attempt at a rock song with a hepped up version of the ancient “It Takes A Long Tall Brown Skin Gal”. Despite showing some promise on this type of more modern material, and despite the market for that style opening up, their final two releases reverted back to an outdated approach and their recording career came to an end. The Four Blues returned to steady club work, sticking together until at least 1952 when they presumably broke up and headed to oblivion.